Industry Case Studies | VGO Inc. Explore a few of our featured case studies below to get a better understanding of the full depth and breadth of our process and capabilities. VGO Testing &amp; Inspection Engineers was retained by an industrial client to determine the cause of failure of a 1-inch diameter carbon steel pipe used to convey 93% sulfuric acid to a demineralizer in the steam plant. The client reported that the line, which was thought to be several years old, failed by developing a hole at an elbow between the discharge pump at the acid supply tank and an automatic valve which controls the flow to the demineralizer. Several months earlier, the same line reportedly developed another leak, downstream of the current failure. VGO Testing & Inspection Engineers was retained by another consulting engineering firm to conduct a condition assessment of the gears from 12 spillway gate hoist system gearboxes from three regional flood control dams. The three dams in question were constructed in the mid 50’s to mid 60’s. Thus, the gearboxes were on the order of 45 to 60 years old, which raised concerns about their continued serviceability. To address these concerns, a contract had been awarded to the gearbox manufacturer for inspection and rehabilitation of the gearboxes. The scope of the contract reportedly called for replacing the gearbox bearings and seals and inspecting the rotating elements, with the expectation that the rotating elements would be largely re-useable. However, the manufacturer’s inspection revealed cracks and other defects on almost all of the rotating elements. 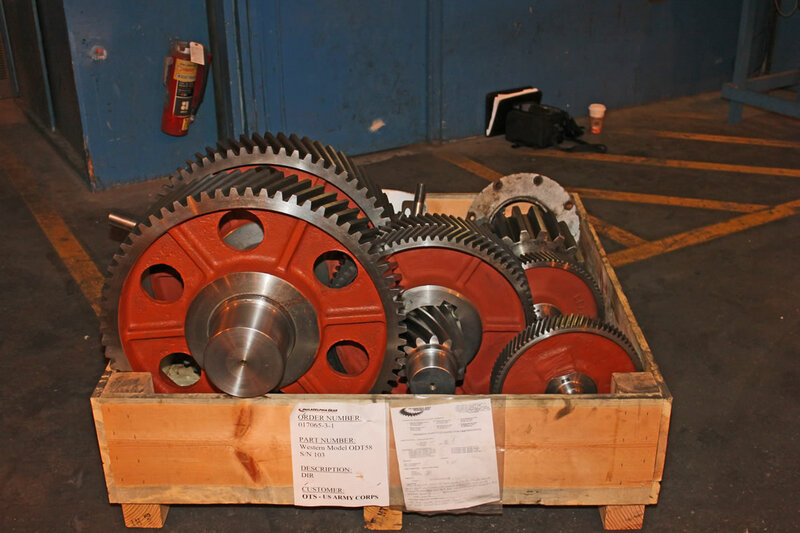 Because of the apparent severity of the cracking and the number of elements affected in the individual gearboxes, the manufacturer recommended replacement of all the rotating elements, retaining only the gearbox housings. Consequently, by the time VGO was retained, the client was already working under the assumption that replacement of the rotating elements of the gearboxes would be necessary. However, due to the long lead time of the proposed gear replacement, there were concerns the new gears would not be available by the start of the flood season, at which time the dam spillways would definitely need to be operational. Thus, VGO’s assignment was to examine the gears to 1) categorize the types of defects, 2) determine the potential mode of failure that could be caused by the defects, and 3) assess the relative level of risk for failure on each of the gears, such that a decision could be made about which ones needed to be rebuilt first and which ones could be re-used temporarily until new components became available.